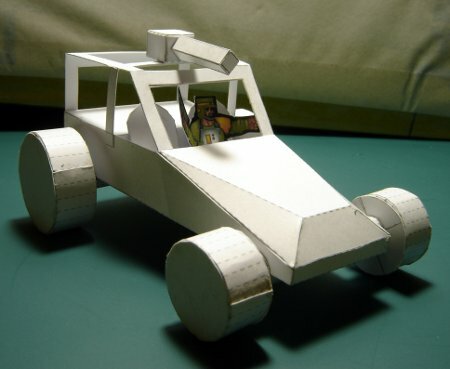 This was another project from late last year a paper Dunebuggy. I was working on it while I was sick so the progress was slow but I did get it finished. It was a much tougher project than I initially thought it would be and took a significant amount of time to complete. In the end the Sand Gecko was born, although with much trial and error. The reason I started this project was that Jim over at One Monk Miniatures put out a very nice card tank. It was simple to construct had some really great texturing and a wide variety of colour schemes. 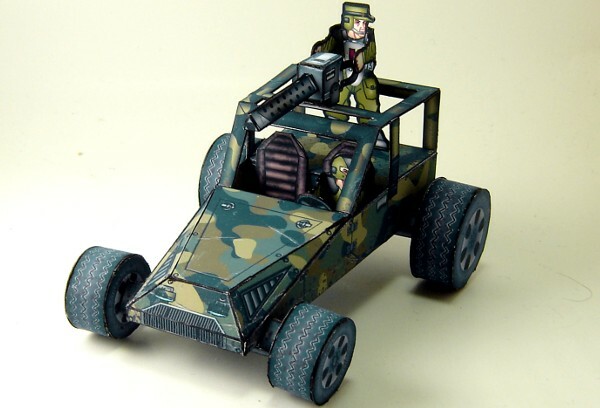 If you need a paper tank for wargamming even as a proxy until your real metal/resin one turns up. I’d recommend heading over and grabbing the Wolverine. I found 95% print out to be a slightly better sizing but thats more my own personal taste. Under Defiance or pretty much any generic Sci-fi wargamming rules I needed a more diverse range of vechiles than just a tank and troopers. I checked over what Jim had planned for the future of Terra-force and no dunebuggy was listed as a potential build (no point in doubling up). 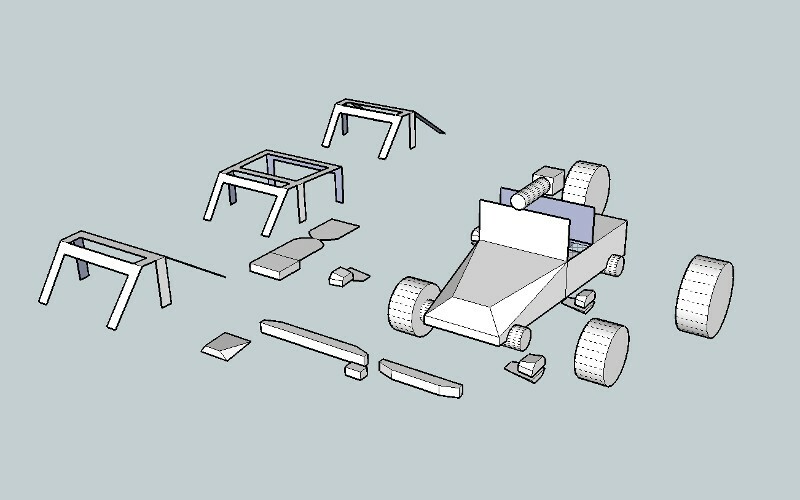 I had also been thinking about designing a paper dunebuggy for a long time but hadn’t been able to come up with any viable way to attach the wheels to an angled chassis. 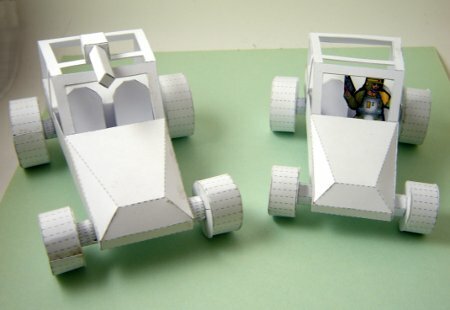 First up came the design phase in the past I’d always tried to design papercraft items in blender/3d max. 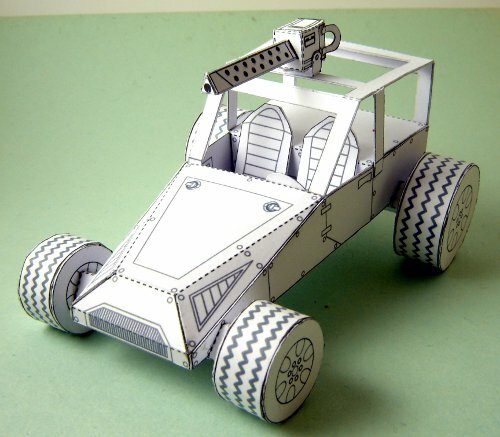 Those two programs always seemed to me to be massive overkill in terms of features and functionality for rather simple meshes that are required for paper models. After looking over a few options I decided to simply use sketchup as it was something I had used extensively for another project and I was most familiar with the interface at the time. It seemed a little on the big size when compared to the wolverine tank or a marine. The half round axles were an absolute nightmare to build. I’d forgotten to build an internal liner for the driver/passenger area. the single card thickness roll cage was to flimsy. Most were minor issues and I doubled up the rollcage and eyeballed an internal liner while building version 1. The half round axle really worried me as it was a complete nightmare to build and very fiddly, additionally trying to build the axle at 15mm would have been near impossible. I was very happy with the square axles, easy to assemble and they didn’t detract from the design at all, the panel lines were added in inkscape but this ended up being a partial waste of time as later I had to texture in Gimp and I ended up drawing/painting over all the inkscape work, it did however provide me with a design guide. Save double backups while working, I lost a whole days work when GIMP crashed mid save corrupting my main working file. Scribus didn’t generate layered PDF’s correctly, ie it would always print all layers no matter what was visible on the screen in the pdf, another onemonk forum user had the same issue (bug track). Although I don’t think the dev’s understand the problem and as far as I can tell it’s still pending repair. 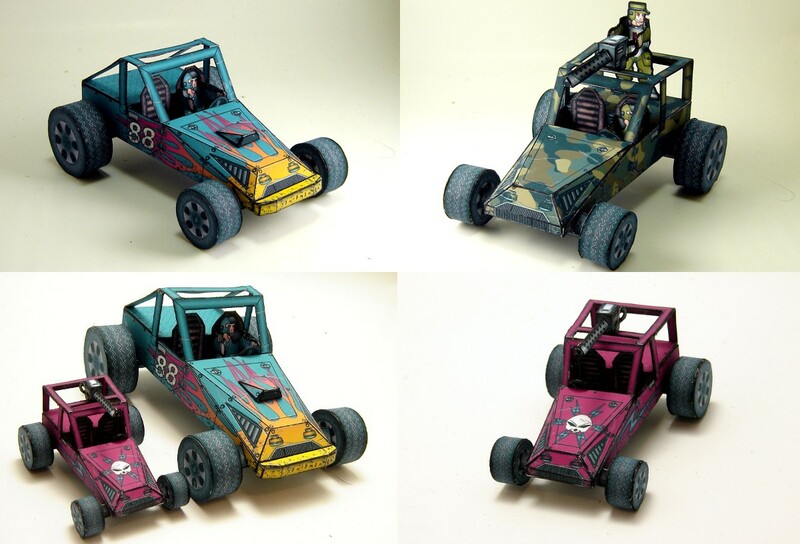 You can use the dunebuggy with Jims Terraforce marines or Slicks NCC Troopers. I did a test and a plastic/metal driver will also fit. This is not exactly a project but it was a fun wargaming weekend and it is what a lot of my projects work towards. I also used a significant amount of time preparing for the weekend over the past 10 days. 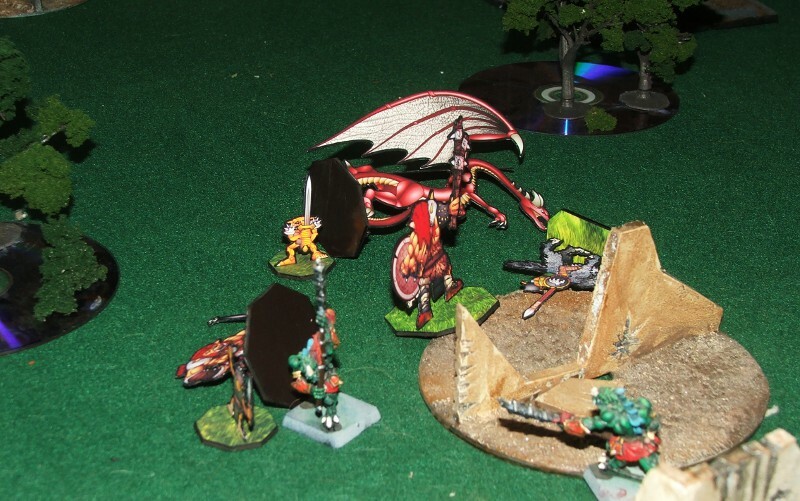 As we had a long weekend I headed to a friends place for 2 days of wargamming slaughter (mostly me being slaughtered). 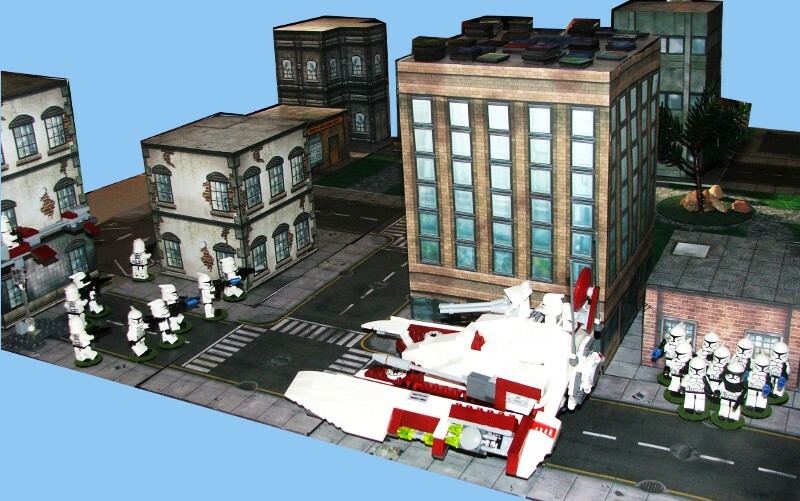 First up was Defiance vital ground, which is a skirmish based sci-fi game which you can use any models for. So the lego clone army was broken out for this game although I had managed to lose my troop list and had to use the generic star marines list. We had an 4000pt army on each side so I got to field a TX-130 for the first time as well as a couple of AT-PT’s and of course some scout and regular clone troopers. I don’t have any scout helmets so the clone troopers with no helmets represent scouts. 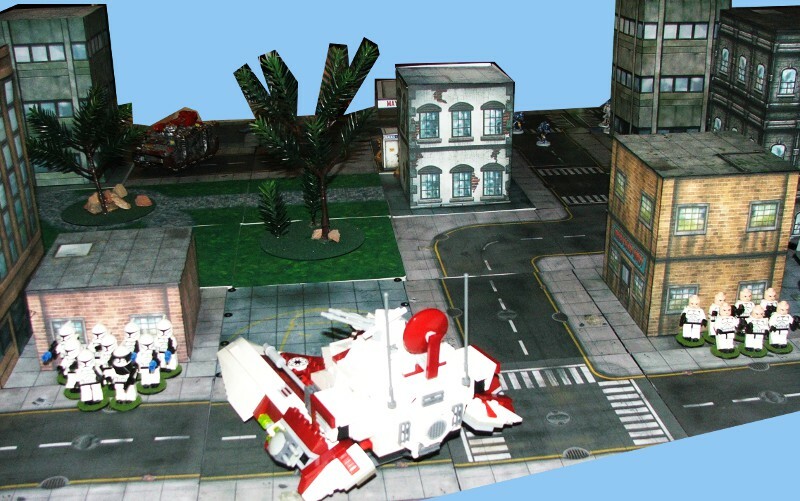 After the UNE troops had finished giving the clone army a pasting they moved on to issue an even more humiliating defeat to the Space thugs (Orks). Making the UNE army the undefeated army of the weekend. Lessons learnt from the above make sure your infantry have some kind of anti-vehicle weapons. We also played a giant game of Songs of Blades and Hero’s. This was one giant game of 300pts a person and 6 factions we had Barbarians, Kobolds+Wyvern, Goblins 1, Goblins 2, Adult dragon + Rat wolverine’s and Lizardmen. We actually made the table a little big with about 6footx6foot playing area. Most of the players were learning as they played and I forgot a few rules which made for some interesting situations. The game was ended in the end by adding an impromptu goal as we had to get up early the next day to clean the location and drive back home. 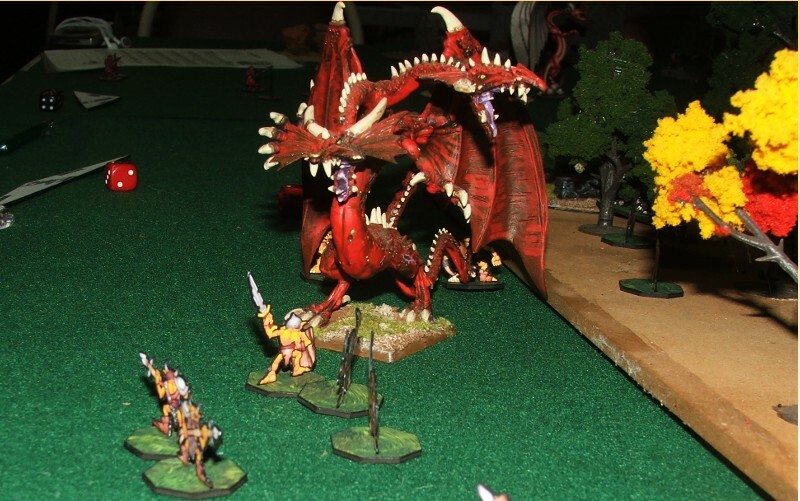 The Adult dragon was virtually unstoppable although it had some issues actually delivering a killer blow, the rats with it had no such problems dishing a quiet a significant amount of death. It was great weekend and hopefully I’ll be able to do another one soon by then I hope to re-write my clone army list for defiance, My Onemonk marines will be done and I’ll have my WWG hinterland layout ready to go as well as some more SOBH warbands + all my frog/bear/turtle warbands. Here are the next set of paper miniatures for Song of fur and buttons. 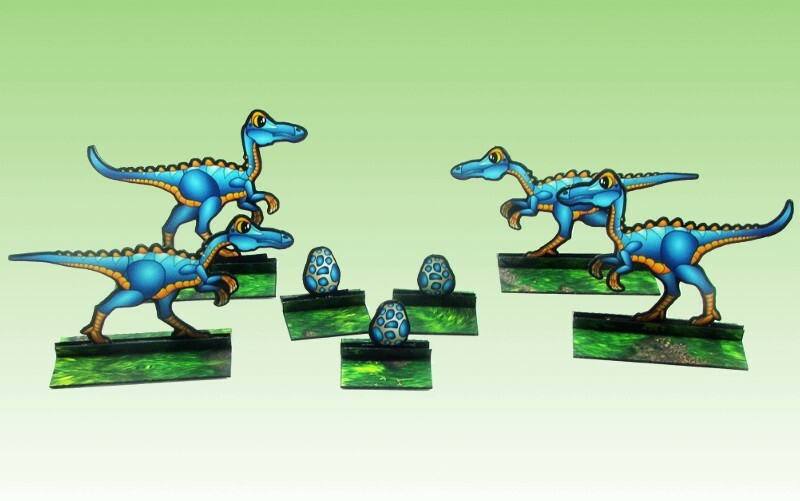 Native bears, Oviraptors , Gallimimus dinosaurs and some egg markers. With these you can do the scenarios in Song of Fur and buttons up to the sixth one. I managed to work out some better settings on my camera so the pic’s are coming out slightly clearer. I basically put a homemade diffuser over the flash so I can use the flash without washing out the mini’s to much. This is in addition to the normal lightbox, it seems to have improved the pic’s a fair bit. I’ll get to work on the pirate bears :). 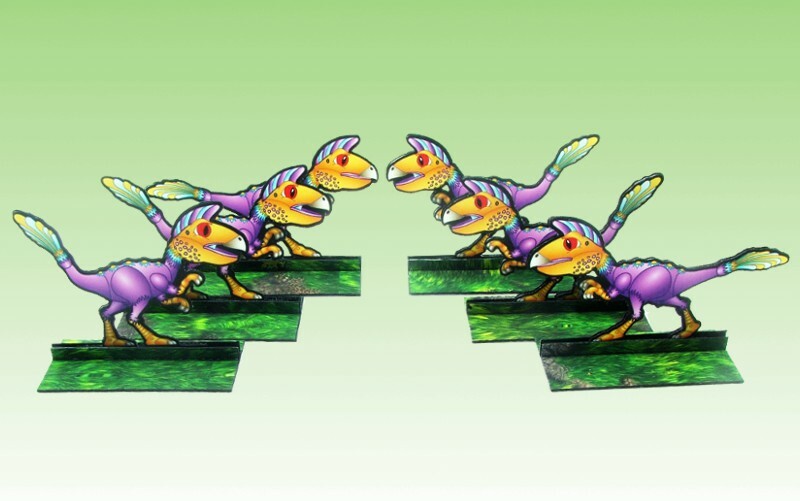 I’ve been working on some paper miniatures for Song of fur and buttons. First up are the Colonial bears and the Compsognathus dinosaurs, I also did some honey pot markers. I did these in a different style to the normal onemonk style a more cartoon chibi style. I found them much easier to draw as the style seems to fit more to my naturally inclined drawing style :). 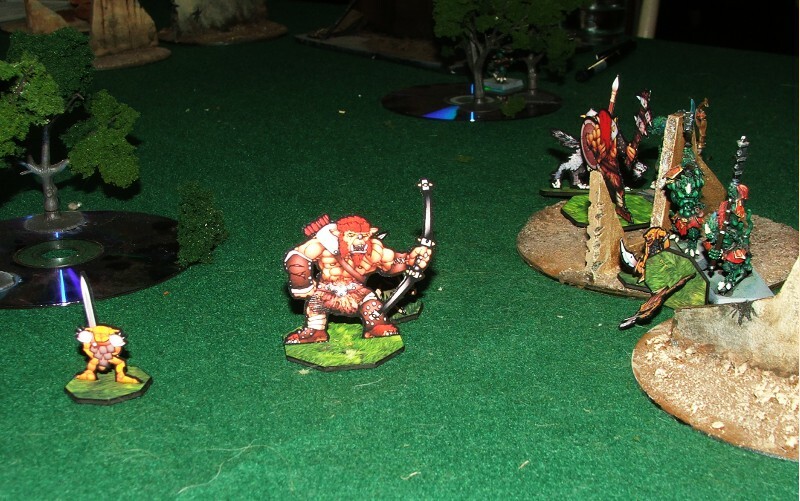 The above miniatures cover the first two scenarios in the fur and buttons book. The files are below, as usual you will need to rename the GSD files after you download them. I’ll finish up the remaining troop types needed to play the scenario’s through over the next week or so. 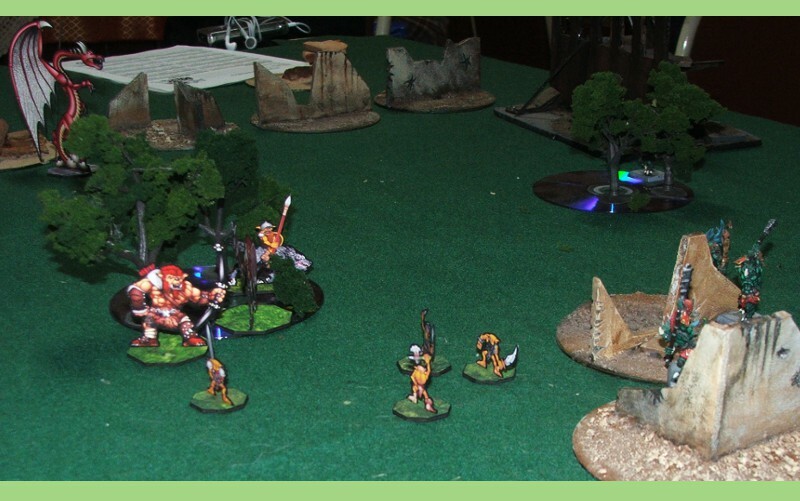 A big thanks go’s out to Ganesha Games and Ben who developed and released Fur and buttons as it really is a fun setting for Song of Blades and Heroes.